This week I've been working on some month-at-a-glance pages for Cecily's babybook. 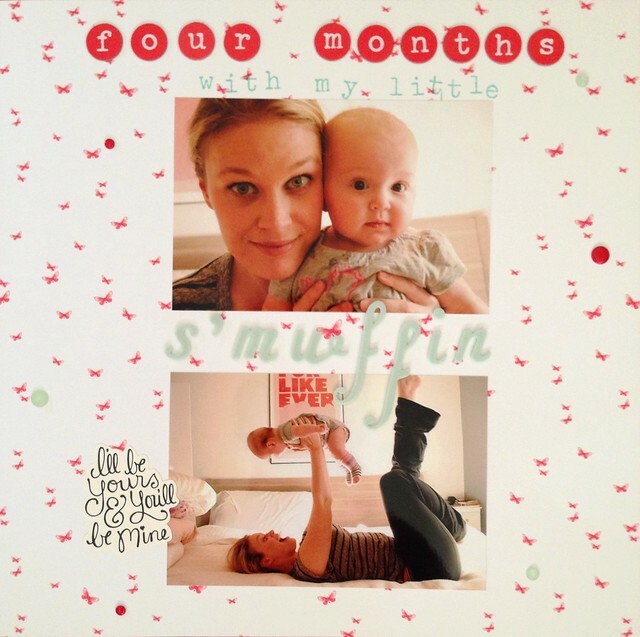 During her first year, Levi took a picture (or two) of me and Cecily on her monthly "birthdays," and I made sure to record some notable things about Cecily each month. Things like milestones, interests, favorites, habits, etc. My plan is to do 2-page spreads for each month. The left side will be a layout with the photos of me and Cecily and the number of months she is, and the right side will include all those notes I made throughout her first year. Right now, I'm just working on the left sides of those layouts and leaving the harder parts for later. Reliving all those sweet memories from Cecily's first year is honestly kind of hard for me. I've loved every stage and I adore the sweet little Silly I have now, but I think I'll always miss all those moments from the beginning. Motherhood is so bittersweet! Anyway, this is the page I finished during naptime today. 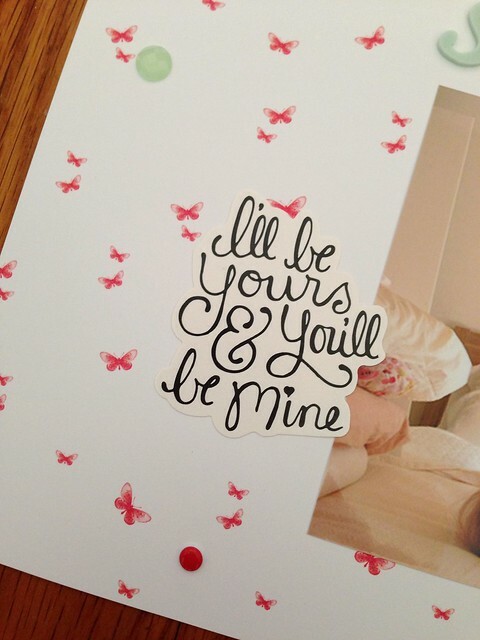 I love these photos and this paper so much that I kept the whole thing super simple. I probably would have been happy just sticking the photos down to the paper and calling it a day! This is one of the pages I made on Cecily's dedication for her babybook. Her babybook is going to be a MONSTER if I ever finish it. It will certainly have to be in volumes, and it probably won't be finished until she's 30. Anyway, this is just the first page with her life verse on it. 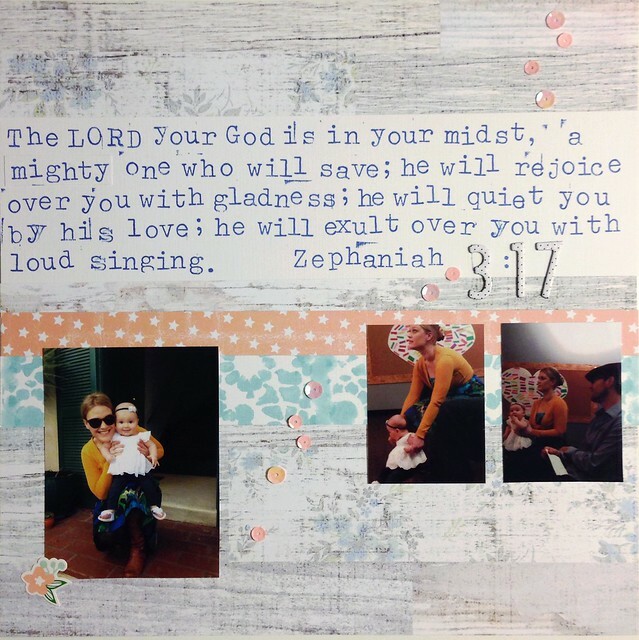 The other pages I make will include the blessing I wrote for her that Levi prayed over her and the little gathering we had with our family afterwards. Scrapbooking her dedication is something that I've been putting off because there's so much I want to include, but I think just starting it helped a lot. I know I could just trim it down and not add all the pages and journaling that I mentioned, but I'm not really a big fan of trimming down. I'd rather end up with a huge babybook. I'm not usually a fan of woodgrain, but I really love this paper I received in my May Studio Calico kit. It's those pretty blue flowers. I wanted to make sure I didn't cover them up so I went with the boards on the paper. I made that blue floral strip with a stencil and the ink dauber I got in my kit. I was actually just playing around with it for practice and was going to throw it out, but when I saw it next to the paper on my table, I loved how they looked together! well, long time no see! i'm not sure if anyone noticed or not, but after a blogging hiatus, i made my blog private last fall. i guess i felt the need to withdraw a bit. since becoming a mother, i've actually felt that way in many aspects of my life. that's probably something a lot of new mothers go through. it probably has something to do with all the medical junk i've been going through this year as well. but tonight i got the crazy idea to try my hand at writing a post again. i'm a sharer by nature. i'm choosing to say "sharer" and not "oversharer" because i don't really like the term oversharing. i think sharing is a generous thing, and i don't like to put a limit on generosity. anyway, i feel most comfortable when the people in my life actually know me, like the real, past-the-surface me. and that goes both ways. i want to know the real them too. i'm drawn to other people who look for this in their relationships too. i approached blogging in the same way. except with blogging, i didn't actually know who i was talking to. i imagined a group of like-minded women (for the most part; i know some like-minded men read my blog too) who read my blog as if they were just checking in with a friend, and that's how i wrote my posts - as if i were talking to those friends, those kindred spirits (don't we all just LOVE that phrase?? i sure do!). and i think a lot of the people who read my blog were really how i imagined them to be! but then i started noticing that there were other people here too. people who weren't checking in on a friend. people who enjoyed criticizing me, my life, my choices, my stories, all that stuff. and when your blog is personal and real and open and honest, that kind of criticism can really get to you. it turned me off to this whole thing and made me reconsider what i wanted to share and where i wanted to share it. and then i just got busy being a momma! and blogging was just the last thing on my mind! the posts i wrote were just for the purpose of recording things i didn't want to forget. but i didn't really enjoy that kind of blogging. it felt more like work. and i really just wanted to be using my hands, making something tangible. i've missed tangibility over the last few years. there's just something so wonderful and therapeutic and beautiful about making something with your hands. even if that something isn't all that great. even if it's just a piece of ikea furniture! so i decided to start recording all those things i didn't want to forget in a new way. i started scrapbooking. like with paper and tape and photos and stickers and all that good stuff! and i love it! i really really love it! i love that i'm recording precious memories and that i'm expressing my creativity and exploring new things. and i love that i'm creating something really valuable for my family. i'm recording our history! and even if we all look back on the pages i've created one day and think, "yikes! that's an awful lot of pink! "i know we'll all see the love i put into them, and we'll be grateful that i took the time to write those things down and print those photos and make it all look pretty. so i think i'd like to start sharing this part of my life here on my blog. the things i create. the ways i'm preserving these memories and stories and maybe the other things i create too. i'd love to connect with other scrapbookers here! or just other people who enjoy making stuff with their hands. or even people who just like to read about other people making stuff! that's pretty fun too!